Spring is officially here and -- short of consistent 70-degree weather -- nothing will get your more in the seasonal spirit like special spring-themed donuts. Krispy Kreme is celebrating by bringing back its popular line of sugary dough rings, featuring bright colors, cute characters, and tasty fillings. They’re officially in stores as of this morning. Bunny Donut: Krispy Kreme’s bunny donut is filled with the fried dough purveyor’s signature chocolate kreme, and dipped in white, pink, and chocolate icing. Egg Donut: Krispy Kreme’s egg donut is filled with Krispy Kreme’s classic white kreme and dipped in a fruity strawberry icing with colorful stripes. Chick Donut: Last, but certainly not least, is the chick donut, which is full of cake batter and dipped in a bright yellow icing. While the donuts are obviously a nod to the Easter holiday, you definitely don’t have to celebrate to find these desserts adorable and delicious.Your coworkers would be lucky to have a box in the office kitchen. You could also just grab a box for yourself. Sharing is overrated, and we won’t tell anyone. 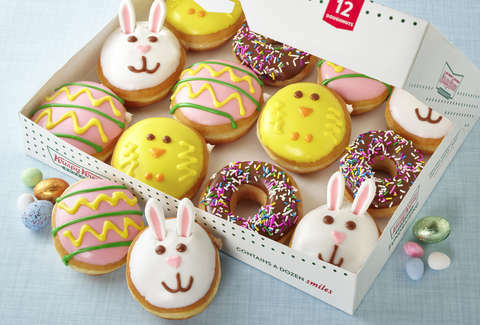 “Spring is a time of renewal and optimism, and these fun, decorative donuts will put a warm smile on everyone’s face,” Dave Skena, chief marketing officer for Krispy Kreme, said in a statement. You can find Krispy Kreme’s spring donuts at participating locations across the US. It’s unclear how long these donuts will be around for, so scoop up a batch while they’re still around and still seem seasonally appropriate.